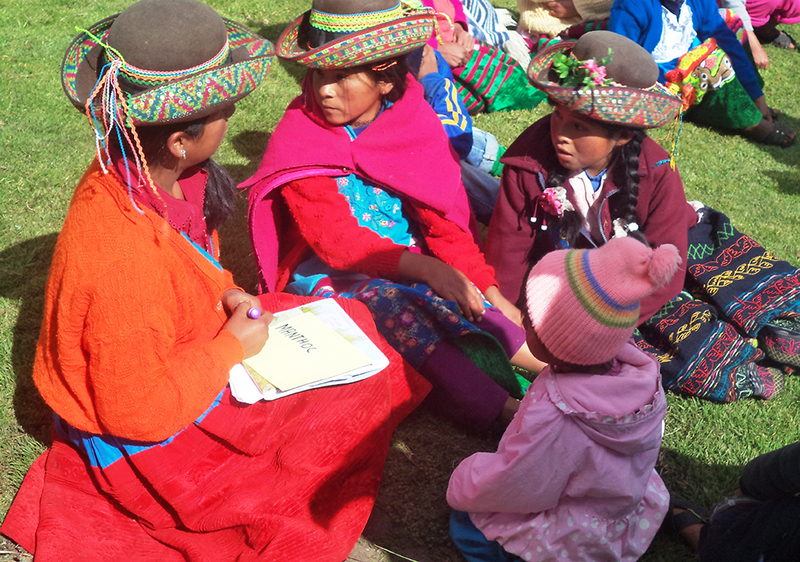 Our programs in Peru provide water and sanitation service to some of the country’s most vulnerable populations, while strengthening bottom-up, participatory management and good water governance. 2) Institutional synergy through the Blue Book initiative and related activities. These projects integrate water supply and sanitation management into basin and watershed-level governance. They also help rural communities build capacities to preserve headwaters, manage water supply and sanitation services, and maintain their own infrastructure. We work primarily in communities located in the headwater regions of Peru where major water sources originate. Isolated at high altitudes, these communities are becoming impoverished as younger residents seek new opportunities in the city. Headwater regions are also the most effected by climate change. Our program in Peru began in 2014, when we developed sustainable water and sanitation infrastructure for the community of Cuchoquesera, at the head of the Cachi River basin, over a two year period. In 2017, we started construction on Project Waripercca, a nearby community which poses a number of unique engineering and governance challenges. We overcame these problems and now both communities have running water. The Peruvian government recently enshrined in law that "ecosystem services" like water are consumable commodities with a cost attached. In practice, this means that downstream water users must pay for the water that they consume – payments that eventually make their way to the upstream communities located on the headwaters. Local communities are then free to invest the funds into water and sanitation projects. Although the mechanism is voluntary, the ecosystem services levy is expected to spur development across rural Peru. There are three main streams for funding. The first is based on the ecosystem services approach, where levies collected from downstream users go directly to indigenous community councils, who are then free to spend as they see fit. The second is the United Nations Green Found, which we coordinate locally with the Blue Book Committee. The third is public funding, through the three ministries that coordinate water and sanitation services in Peru. The approach that we have developed has so far only been tried in Peru, but could work anywhere in Latin America. Promote sustainable governance on a national level by integrating eco-systemic approaches, citizen participation and decentralised financing. A sustainable rural water supply system for 150 families at the watershed head, with a 20 year expected lifespan. A sustainable sanitation system consisting of ecological toilets for 150 families, with total re-use of excreta and grey water. A new community-based water management body that integrates rural water and sanitation management (JASS) into water and environmental management (GAA). Thus, a single community-based body (JASSGAA) will administrate water supply, sanitation and the watershed head. The establishment of a participatory management plan for the head of the Cachi River basin. Proposal of new national water management policies developed in a participatory manner with the government and civil society. Since Earth day the community of Wariperqa – in Peru – has drinking water!